On Christmas morning we usually have something special. 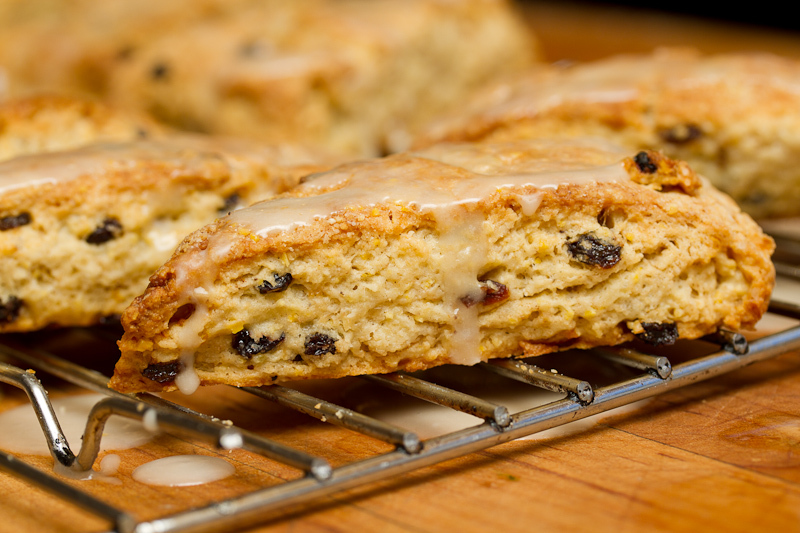 This year Jody decided on scones, Lemon-Bay Scones with Currants. Which meant that this past week she’s been running a bake-a-thon in quest of the perfect scone. I work at home, usually alone, and the availability of incredible treats can make the atmosphere just a little too temptation-of-Saint-Anthony, if you know what I mean. Even when I remained in my upstairs office the beguiling aroma of lemon and bay butter would wend it’s way to me like a distant refrain of Bali Hi, the magic island… Why don’t Aeron chairs come with seat belts? “I’m just tweaking them,” she’d say, holding up the latest batch every time I drifted into the kitchen. “Tell me what you think.” Then she’d breeze airily off to work, abandoning me with yet another tray of goodies. Combine the butter and bay leaves in a small saucepan and cook over medium-low heat until the butter is toasty brown, about 15 minutes. Remove from the heat and allow to cool 5 minutes. Remove and discard the bay leaves. Add the lemon zest and pour the butter into a 6” x 6” flat plastic container. Freeze. It will take about 20 minutes. 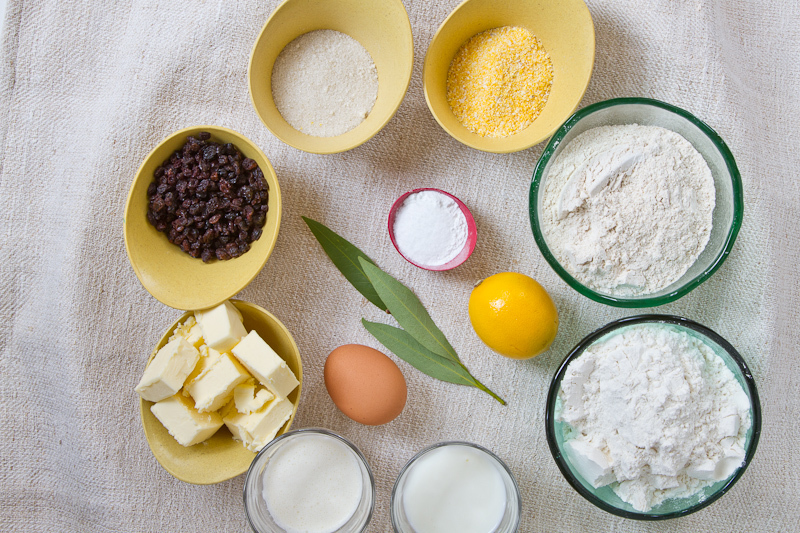 Line a baking sheet with parchment paper and dust with flour. Spoon 2 tablespoons white flour over the currants. 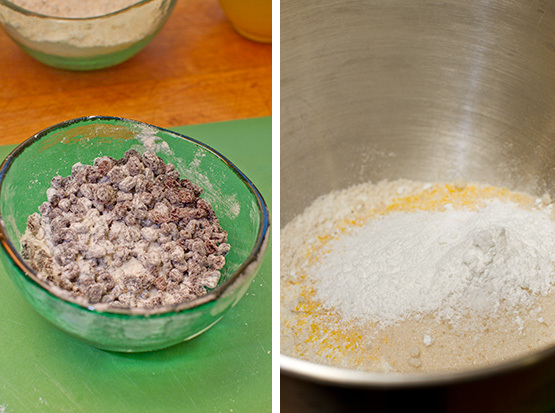 Toss until currants are evenly coated with flour. 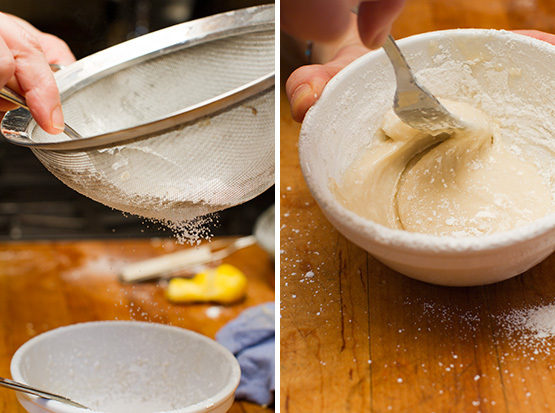 Combine the remaining dry ingredients in the bowl of a standing mixer. Use the paddle to mix well. Add the currants and mix again. 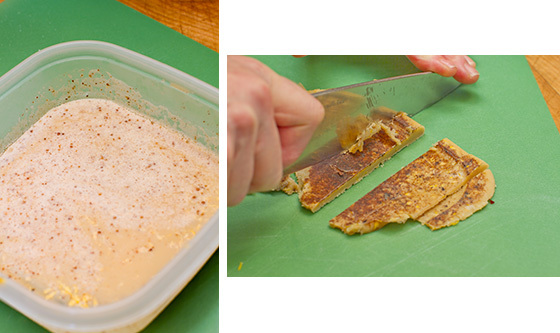 Remove the brown butter from the freezer and pry out of the plastic container onto a cutting board. Cut into 1/2-inch pieces. 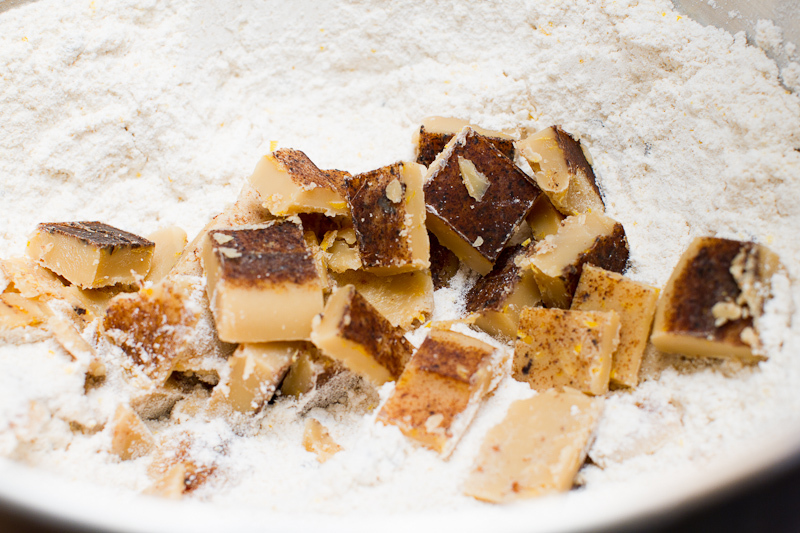 Add the brown butter to the flour mixture and mix for 1 minute or until the butter is in pea-sized pieces. In a small bowl, beat the buttermilk, cream and egg together with a fork. Add to the scone mixture all at once and mix for 20 seconds or until the dough is just coming together. Remove the paddle and bowl from the stand. 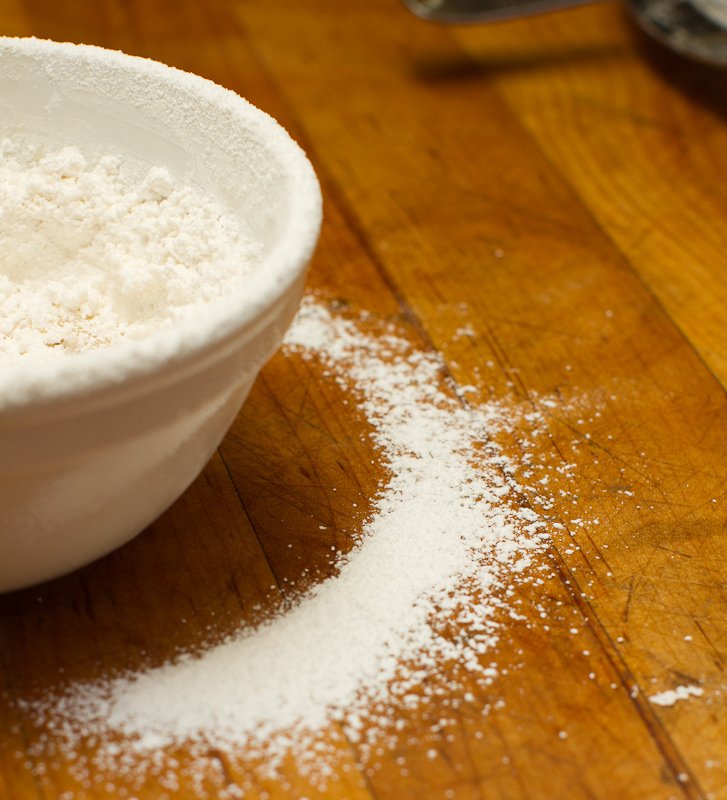 Using your hands, turn the dough over several times to mix in any flour lingering at the bottom of the bowl. Turn the dough out on the parchment lined baking sheet. Dust your hands with flour. Give the dough a few turns and pat it into a circle 1 inch thick. Using a chef’s knife, cut the circle into into 12 pie-shaped wedges. 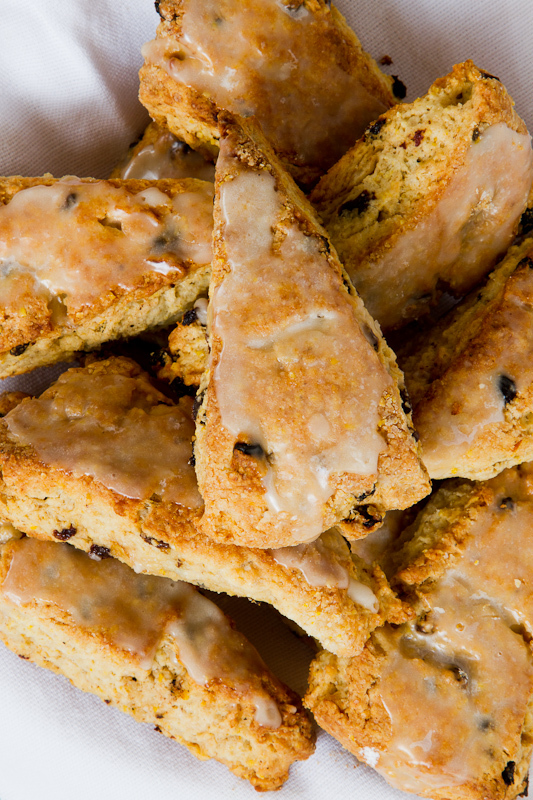 Separate so there’s at least ½ inch of space between each scone. 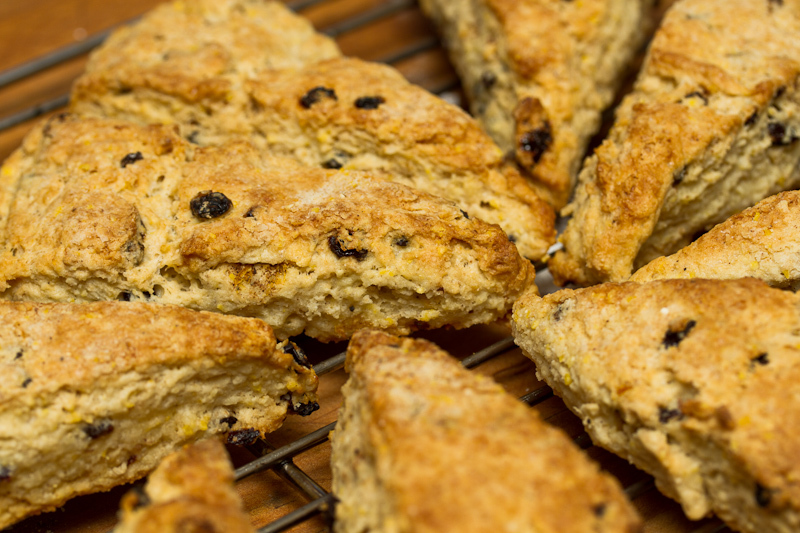 Put the tray with the scones in the freezer for 10 minutes to chill them down. Preheat the oven to 400 degrees. Bake 30-40 minutes or until they’re toasty golden brown on top and firm to the touch. Transfer to a baking rack to cool. 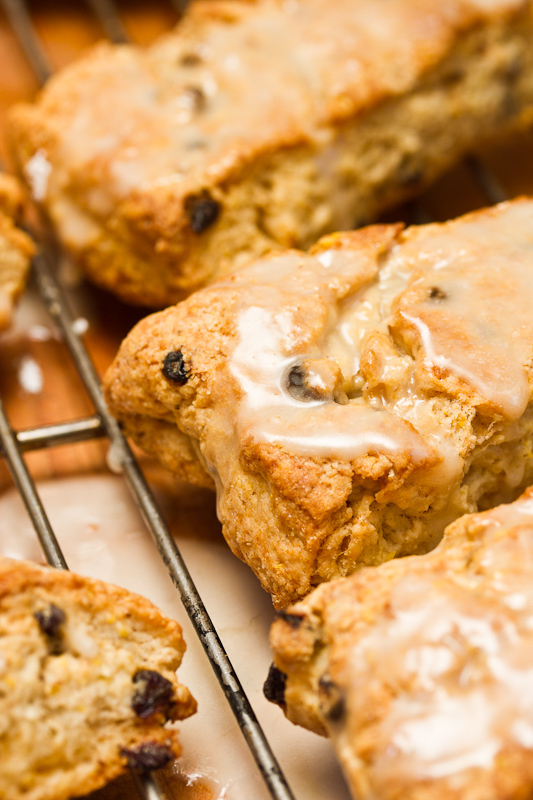 When the scones are cool, sift the confectioner’s sugar over the lemon juice and beat to combine well. 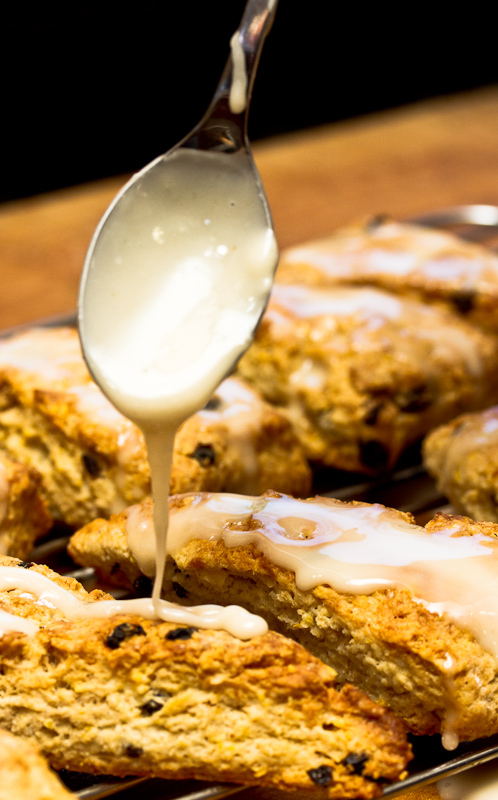 Spread the glaze over the scones. Give the glaze a few minutes to dry. If not serving immediately store them in a brown paper bag–for a day, at most. I wanted to make scones for Christmas morning, crumbly buttery ones with some substance, not the poofy airy versions. A different wrinkle on the usual flavors would also be nice. After paging through a lot of books I ultimately zeroed in on Joanne Chang’s currant scones from FLOUR for a general approach. 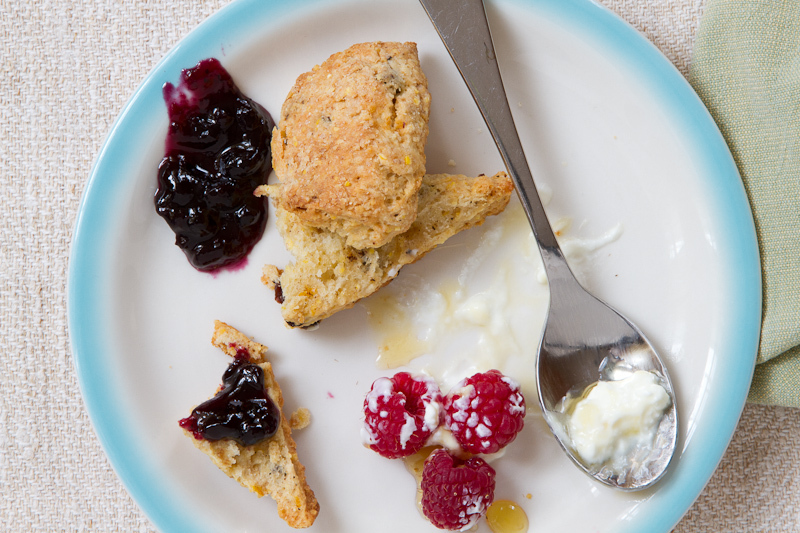 Nancy Silverton’s jam thumbprint scone recipe, included in the anthology BAKING FROM THE HEART, also appealed to me for its use of brown butter. Brown butter? I knew exactly what to do with that–flavor it with bay leaves. Bay leaves are the Maytag repairman of herbs. They sit quietly in glass jars, growing drier and more brittle by the hour, brought out only for an occasional chicken stock. Check your cupboard–I bet you have some dating back at least 5 years. Throw them away. Get yourself to a store that sells fresh bay leaves. Or order some online. Unlike rosemary, which flaunts its scent (you just have to look at a sprig of rosemary and you can smell its piney aroma), bay leaves give up their flavor only with some coaxing. They have an elegant, almost butterscotch flavor that’s incredible in brown butter. With most of the recipe in hand, I couldn’t resist the Meyer lemons that I found in the market. I finished by adding cornmeal for texture, as well as whole-wheat pastry flour, if only to relieve the guilt for all that butter and cream. Three–or was it four?– batches later I had the recipe I wanted. Ken loved them so much he took some downstairs to our neighbors, Alden and Lisa. This entry was posted in Breakfast, Easy, Vegetarian and tagged bay leaves, brown butter, cornmeal, currants, pastry. Bookmark the permalink. ← Is That a Fig and Walnut Salami? Or Are You Just Happy to See Me? Designated scone sampler indeed… Sometimes, the neurotic me is frustrated that there is not enough time to cook (and eat) all the wonderful things the world’s cuisines have to offer. I’ve been baking and eating cookies and antibiotics for weeks. Ready to return to the land of the living and these scones and the fig salami, which I’m hoping to have as a Christmas Eve appetizer, are on the top of the list. Happy holidays to you and yours. You poor thing, with an evil temptress like Jody baking batch after batch of addiction just down the hall…I am praying for you, Ken. Love the frozen brown butter trick, very clever, and I bet it is the key to these lovelies. Putting these on the holiday baking schedule for sure. I seriously hope you two are working on a cookbook. I’m running out of printer ink! I just have enough time to ferret out new bay leaves before the stores close for this recipe-definitely a must for tomorrow (!) morning. As always, Jody’s tweaks are awesome (and so are photos). Enjoy all the commotion with Oliver and Roxanne et al around! I’ll be munching on these and thinking of you. Merry Christmas to all! I can’t believe I missed this post–blame it on Christmas craziness. Brown butter? Bay leaves? Baked goods? Looks fantastic! It’s been an insane few weeks with woefully little time in the kitchen but I will make these soon! (I actually really love whole wheat pastry flour, now that I understand better how to use it. (My first time using it resulted in a birthday chocolate cake that tasted like pumpernickel bread–love chocolate cake, love pumpernickel, but they don’t really substitute for each other). I made these today–amazing how aromatic the brown butter is even when it’s frozen. They were delicious. I chilled them on the front porch pre-baking. Hello! A friend just sent me a link to your blog, because they thought I’d like it, and I do! Lovely photos and writing. I’ve been meaning to try a recipe for something sweet with bay & lemon. I saw something similar in Mrs Beeton, if you can believe it! It was a recipe for a baked pudding. Not sure I want to make a baked pudding, but I was thinking of trying the combination of flavors. My son was asking if we could make lemon ice cream – maybe I’ll try lemon and bay ice cream! I just came up with a new method, and I want to try it a million ways, so this is just the chance! And the weather for it.